According to the NIH Public Access Policy (NOT-OD-05-022), investigators funded by the National Institutes of Health (NIH) must submit an electronic version of their final, peer-reviewed manuscripts to the National Library of Medicine’s PubMed Central (PMC) upon acceptance of publication. PubMed Central, which is NIH’s free digital archive of biomedical and life sciences journal literature, will then make the paper freely available to the public no later than twelve months after publication. Making research results publicly accessible is important not only to the NIH, but also an essential element of UCLA’s commitment to academic freedom and its mission as a public research university to create and disseminate knowledge for the betterment of society. Below is the recommended language for acknowledging the CHIPTS grant on publications. Feel free to edit as needed for your specific journal. All CHIPTS and CHIPTS-affiliated investigators are strongly encouraged to cite the CHIPTS grant for any HIV-related publications or publications related to the Center’s scientific theme. Also any recipients of CHIPTS funds (including pilot grant recipients and scholarship awardees) should acknowledge the CHIPTS grant in their publications and presentations. All papers that are under the NIH Public Access Policy, whether in press or in print, MUST include evidence of compliance. 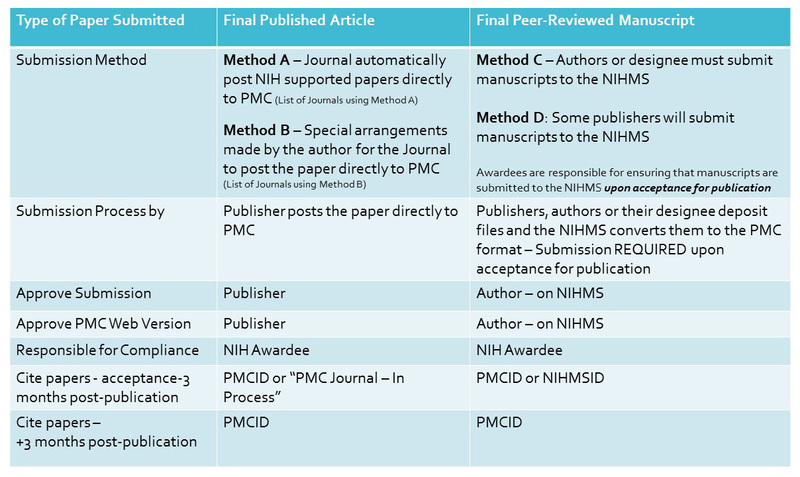 – Final peer-reviewed manuscripts must be posted to the NIH Manuscript Submission (NIHMS) system upon acceptance for publication, and be made publicly available on PMC no later than 12 months after the official date of publication. Investigators must include the PMCID or NIH Manuscript Submission reference number when citing applicable articles that arise from NIH funded research. To learn more, click “Cite” tab. Your manuscript will fall in one of two categories: Final Published Article or Peer-Reviewed Manuscript. There are two methods per category (four methods in total) to ensure that your manuscript is properly submitted to PMC. The Author designates the number of months after publication when the manuscript may be made publicly available in PMC. Then, via NIHMS, confirms that the deposit of the manuscript is consistent with any publication and copyright agreements so that NIH can begin processing the manuscript for use in PMC. The Author must approve the PMC-format manuscript. After converting the manuscript to a PMC format, NIHMS will email the author for approval and corrections can be made at this time. The NIHMS will email the authors the citation with the PMCID once it is assigned and the manuscript will be publicly available after the designated delay period. Investigators must include the PMCID or NIH Manuscript Submission reference number when citing applicable articles that arise from NIH funded research. List the PubMed Central reference number (PMCID) at the end of the full journal citation for the paper in NIH applications, proposals, and reports. A PMCID is the only way to demonstrate compliance for these papers. When using Submission Method A or B, indicate “PMC Journal – In Process” or the PMCID at the end of the full citation. When using Submission Method C or D, provide a valid NIH Manuscript Submission System reference number (NIHMSID) or PMCID at the end of the full citation. (Note: NIH awardees are responsible for ensuring that all steps of the NIHMS submission process are complete within three months of publication). NCBI and the National Library of Medicine have created information and tutorials on how to manage your compliance to the NIH Public Access Policy, using MyBibliography. My Bibliography: Public Access Compliance(3:26 min. video) – Tutorial on how to use the MyNCBI and MyBibliography to manage your Public Access Policy compliance. My NCBI Redesign– Instructions on using MyBibliography to view compliance status of your articles (under the “My Bibliography” section). Video of the September 6, 2013 session at the UCLA Louise M. Darling Biomedical Library, including live demonstrations of using the MyNCBI My Bibliography and the NIH Manuscript Submission System. A short video overview of the policy created by NYU Health Sciences Libraries and NYU Office of Research Education. Tutorial from the National Library of Medicine on using the MyNCBI My Bibliography feature to manage Public Access Policy compliance. Video of the April 5, 2013 instructional session at the UCLA Louise M. Darling Biomedical Library.